Perched amid the rolling foothills of the Blue Ridge in the South Carolina upstate and steeped in a tradition of Southern hospitality, Greenville is quietly emerging as the region’s next great mountain city. 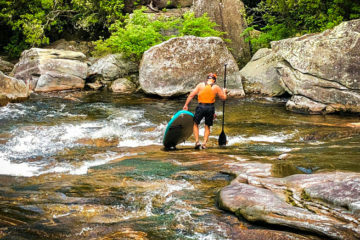 With less hype than nearby neighbor Asheville, yet set among a similar and in some ways more accessible landscape, Greenville has become a haven for outdoor enthusiasts. Twenty-five miles north of Greenville, Jones Gap State Park and Caesars Head State Park combine to form the pristine 11,000-acre Mountain Bridge Wilderness Area. 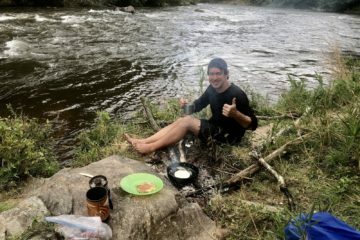 Bring your fly rod as you walk the Jones Gap Recreational Trail, which follows the Middle Saluda River and go trolling for trout, or take your time and do an overnight on the Ravencliff Falls Trail loop. Once plagued by industrial pollution, the revitalized Reedy River, which runs right through downtown, has become a popular spot for local paddlers in recent years. A favorite for an after-work dip is the three-mile, class II-III stretch between Log Shoals Road and West Georgia Road. After heavy rain, you’ll catch brave boaters running the massive class IV-V Reedy River Falls at Falls Park downtown. Home of the USA Cycling Pro Championship bike race, a high-profile qualifier for many Tour de France hopefuls, Greenville has a lot of choice routes for road riders. The hearty climb to the top of Paris Mountain is where local resident and Tour de France stalwart George Hincapie trains for his big upcoming races. 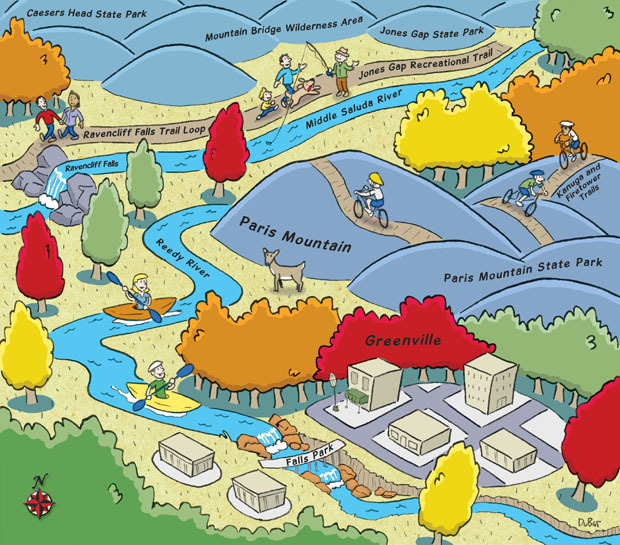 Just outside the city limits, Paris Mountain State Park offers some of the best downhill mountain biking trails in the southeast. Try the bomber runs down the Kanuga or Firetower Trails, and if you’re in a competitive mood head to the park on November 13 for the South Carolina Gravity Championships.